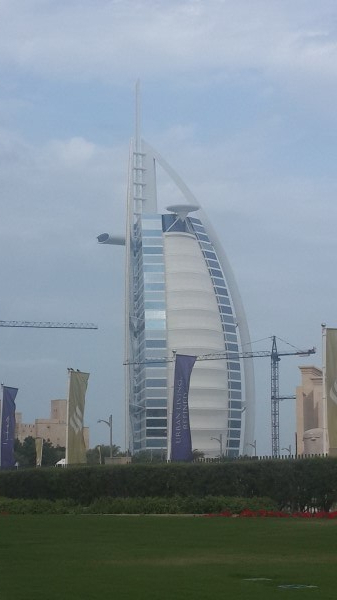 With a lot of luxury brands on the mind, I landed in Dubai. The excitement of the ongoing shopping festival was at its peak. The distance between the hotel and mall seemed more than Delhi and Dubai. The wait was over at the entrance of Burberry, Dubai mall, my soul was running far ahead of me. After Nasa, Dubai does this..
As soon as I turned the price tag of one the bags that I would have loved to buy, my excitement was dragged to the basement from the top floor of Burj Khalifa…hahahah..I am sure many people must have heard that the shopping festival in Dubai offers a mouth-watering price but that’s not true! The prices are not that attractive. In fact, I bought a Gucci’s pair of glasses which cost more in Dubai and less in India. So, don’t keep your hopes high on this festival. Without a doubt, Dubai is an epitome of Luxury and at least 5 days trip is recommended to look around the city. This article will cover the Top things to do in Dubai city which also includes the Best Tourist Places to Visit in Dubai. Keep reading! Downtown, Downtown, Downtown no doubts about it. The prices are little higher here than the outskirts for obvious reasons but it’s worth it. 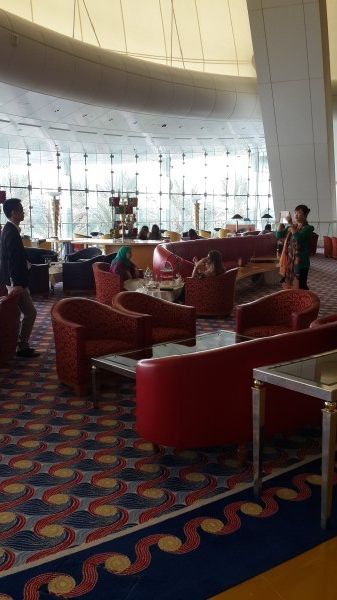 You will find hotels around 85 USD per night like Hilton which is nearby Khalifa. It is better to stay near the attractions so that you spend less time and money commuting. Also, please avoid wearing thongs on beaches as you will be looked at with disrespect. A normal bikini is fine, carry a scarf or something along. Shorts and skirts are fine in public places. At times, the cars turn upside down but don’t worry the cars have tubes attached to the inside top of the car, you will see it once you are inside, which protects everybody from major injuries. Mostly ride are safe as the drivers are really experienced. After the ride, you are dropped at a camp kind of place where you can find some food n souvenirs shops, and you also get to see belly dance. Yes, you heard me! and it is really good. Men do carry your glasses, you don’t want your ladies to know where you are staring, haha! After the dance, you are dropped back but this time the ride is stable. There are 2 options that you can avail, one is to 124th + 125th floor and second is to 124th + 125th + 148th floor. This tower has 160 floors and the highest deck is on the 148th floor with an OUTDOOR terrace. 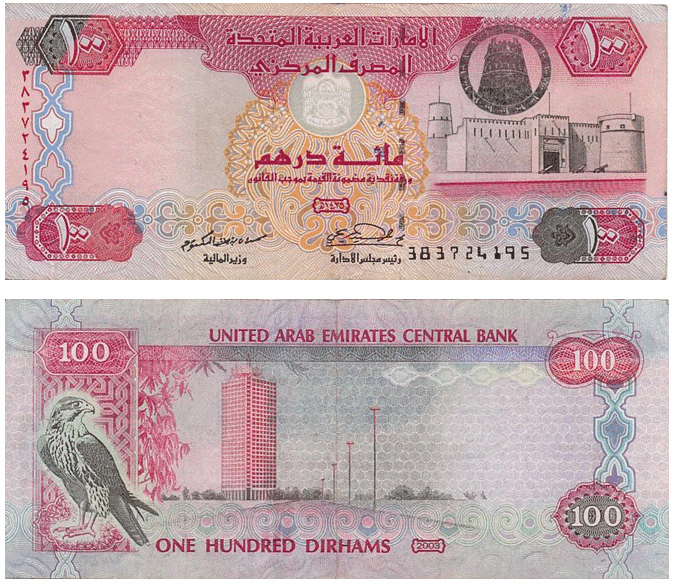 The price is more than double for the second option somewhere around 530 AED. I went with the second option as I love heights, you get a personal tour guide who takes you from the bottom to the 148th floor and tells you all about the tower, everything that you need to know. You get snacks at the top and lounge access at the entry. 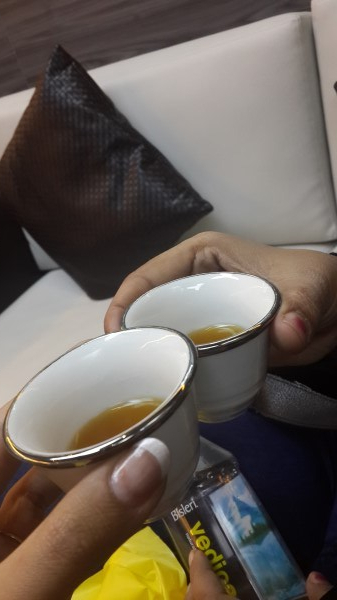 That’s me and my mother enjoying special tea at the lounge. 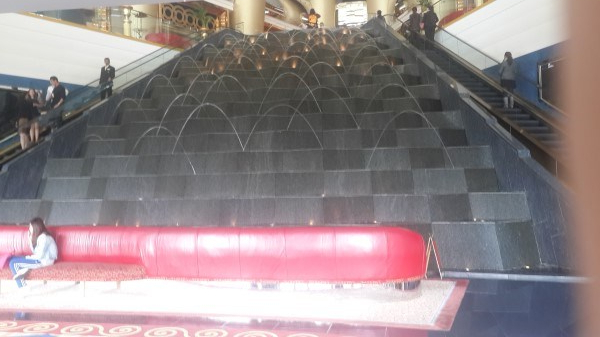 The best part is the outdoor terrace, image standing at the 148th floor and looking downwards!! Guards are deployed all around the terrace so you don’t make any mess. There is a souvenir shop as well but no point buying stuff from there. Just enjoy the view with your drinks. The best time to visit the deck is before the sunset so that you can enjoy both the views. One with the sunlight and the second watching the entire city glowing with lights and also the fountain show. 124th and 125th floor are also amazing with high powered telescopes. Zoom in your way! 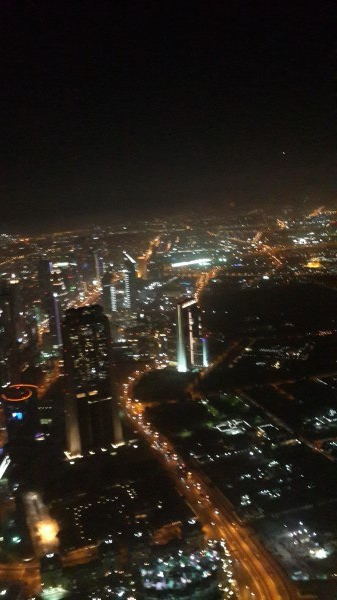 You need good 3 hrs at least to explore the tower if you are opting for 148th floor. Don’t carry any baggage with you, carry selfie stick and don’t go there after a tiring day because then you will not be able to enjoy completely. These are the people behind the tower, I heard back in 2015 that Sharjah is planning to construct a tower to compete with Burj Khalifa, taller than it. My excitement was at its peak when I was about to reach the only (unofficially rated) 7-star hotel of the world, in the morning for breakfast, anyone can book a table there for a meal. It is served as buffet and costs approx 350 AED pp. There are many other amazing restaurants here where you can book a table but only breakfast at cafe offered vegetarian food. I had no other choice. 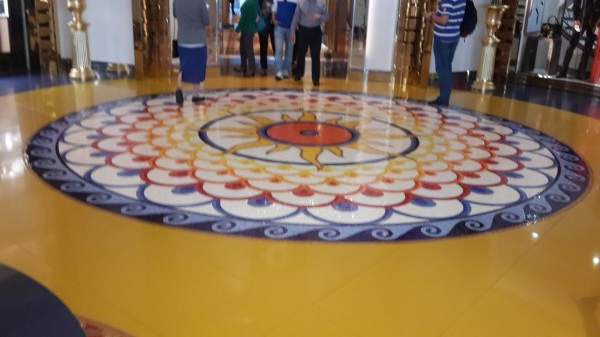 This is how the ground floor of the hotel looks like. You can only visit the ground floor and you don’t get access to any other floor until you book any room, which you can’t or you shouldn’t. The prices (INR) are from 7 Lakhs/night to 12 Lakhs/night! Although the breakfast is a buffet but you are served on the table. You ask whatever you want from the menu and any number of times. The food was delicious. 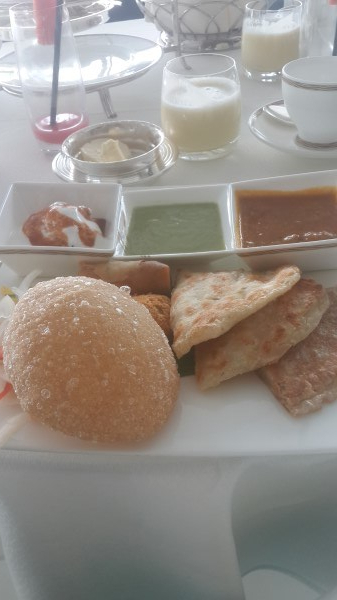 You get puris, paranthas, juices, chats, fruits and everything that you will wish for in an Indian breakfast. This is how the floor looks like, there are a few luxury brand outlets on this floor. 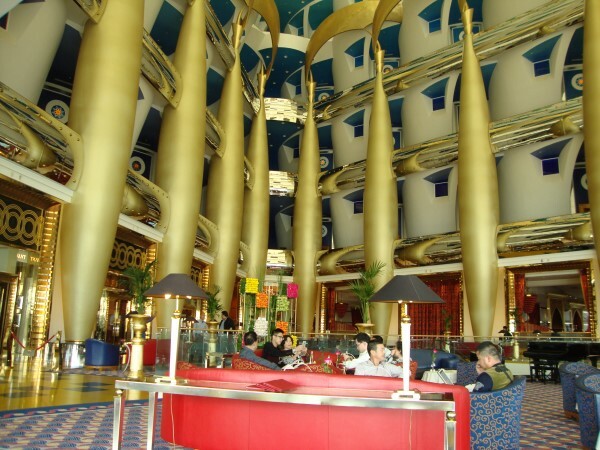 Other floors have gold plated railings, stairs and what not! Most of the things are gold plated and of the utmost quality. 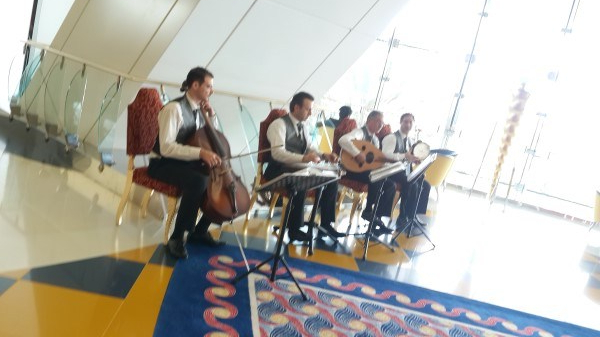 The cafe had live musicians, and the fountain is at the entrance. 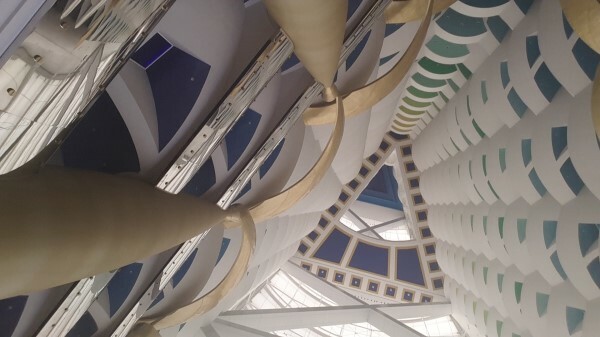 It has multiple theme-based restaurants, one is under water ‘Al Mahara’ where you can enjoy seafood by famous chef Nathan Outlaw. I was lucky enough to find it online as I have never seen a tour operator telling anyone about this. It is like trade fair in India but far better than the same. You will find here exhibitions and stalls from worldwide, even from India. It is a lively place and you must visit it. There are many cuisines and shows which you can enjoy here. It is open from 4pm to 1 am and you should reach here by 4 30pm to cover the entire place. It will easily take 4 – 5 hours (min). You will find stalls from countries like Thailand, France etc here and products are also nice. They do bargain so don’t forget to try your luck. Food and sitting areas are easily available. Carry a backpack with you to put stuff so that you can roam easily. I couldn’t visit this place but I regret it. 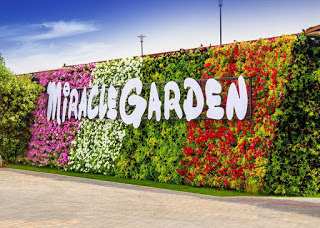 It is world’s largest flower garden. 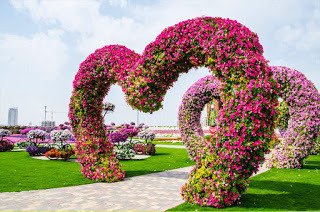 It is very beautiful and if you love flowers and nature then you must visit here. 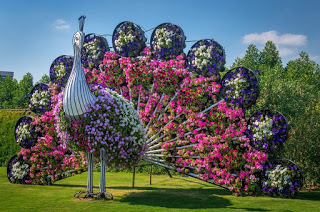 You will find all kind of beautiful flower arrangements here, it is better than Garden by the Bay, Singapore. Oh I wish, I really wish I could do it but I am not allowed to 🙁 I will jump the day I get the slightest hint of agreement. Well for all those fortunate people, who can. 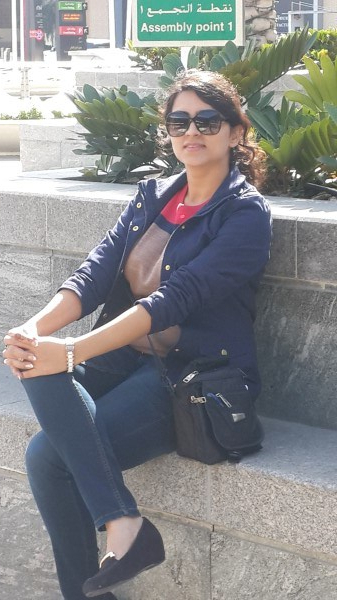 Dubai is a good place to experience it. 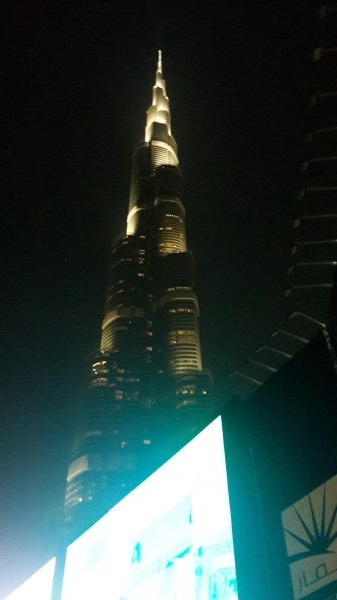 With world’s tallest skyscraper nearby you can enjoy it to the core. There are other locations as well as you have an option to jump from. 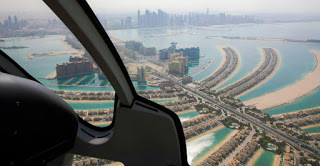 You can also try a helicopter tour of Dubai, I didn’t. 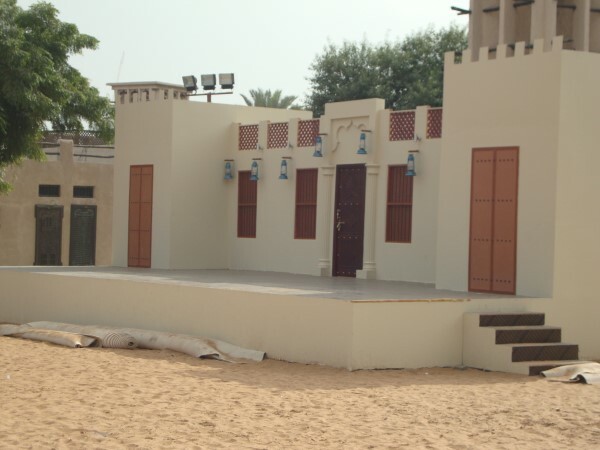 You get 3 options to choose from 12mins, 22mins and 40mins and price varies from 675 AED to 1750 AED. I saw Dubai from a height while I was in the plane, it is symmetrically beautiful, do notice. But this ride will take you to famous places to show you the aerial view. It is okay. I didn’t like it much, you might as I have heard good reviews as well from others. If you go then stay in time otherwise they will leave you and go. They are really punctual, 8 pm means 8 pm, not even 8:01. Above is the list of Best Tourist Places to Visit in Dubai, continue reading to find out all the Top things to do in Dubai. You must be wanting to buy Gold, I know, it’s like people wanting to buy TV from Singapore/Thailand. You will find N number of gold shops in this market. The prices are almost same as in Delhi but the quality is not. The quality is superior so you must buy some gold ornaments. Buy dry fruits – Walnuts, Almonds etc. the Raisins are really sweet as to compared to the one that you find in India. So do taste it before buying. 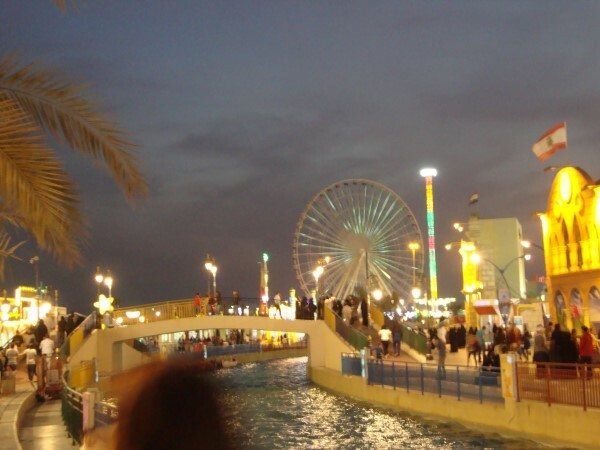 There are around 120 types of Dates that Dubai offers. So if you like it then it’s heaven for you..
You will also find a few apparel brands and eyewear shops here. Gift land – the shop which offers 10 AED products, it is good. You can get a few useful products here. Do visit and buy souvenirs. Nivea cream is cheaper in Dubai, grab a few. I will start writing about it but I don’t know if I will be able to finish it off, I guess I’ll just write the main things. 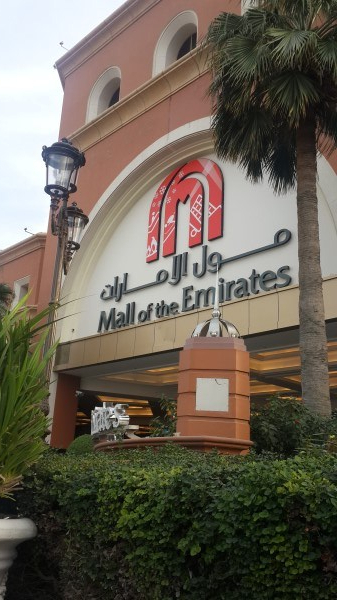 It is the largest mall in the world, the shops are so widespread that you won’t be able to find the specific stores by yourself. Do check out the directory. Don’t go here by metro otherwise, you will really have walk a lot. It is better to use a taxi. Taxis are expensive in Dubai, metro is really convenient and cheap but for Dubai mall just prefer a taxi. Don’t buy cosmetics from the brands which are available in India because most of them are expensive in Dubai. The sale period is just normal like you have in India. 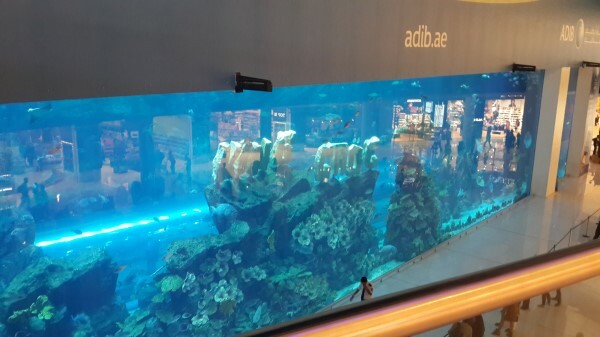 This mall is hugee, it has an aquarium in it, 1200 shops, entrance to Burj Khalifa, skating ring, huge fountain etc. You will get everything that you want here. You can also check out electronics but you will not find many new technologies or any exciting techy stuff. It has a snow park inside! I found this mall prettier than Dubai Mall. This is not as huge as the above so you will easily find your way. And that’s me.. Your very own guide.. haha.. Do you see the bag on my side, I don’t know why I fell in love with it and carried it around so many countries, may be 10 or 12. However, now I don’t. It is famous for fake luxury brand bags, you will find many bags here but I didn’t like the quality. The prices are also too much. Get down at Al Karama metro station for this market. You will have to walk a little to get there. 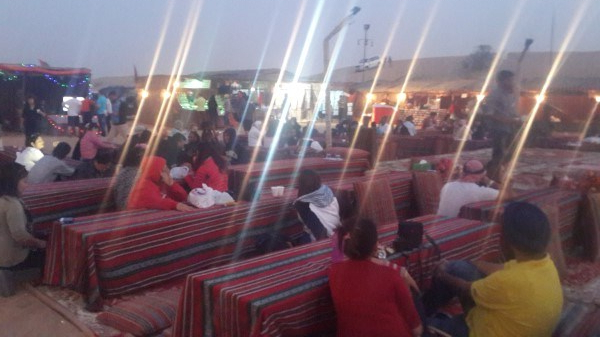 Experience the culture of Dubai in this market, I didn’t visit it but have heard about it. If you have extra time, go visit this place at night. Get down at the Burjuman metro station. Dubai has hot weather throughout the year, November to March is comparatively cooler. The temperature stays around 25C. Dubai is GMT+4 that means it is 1:30 hrs behind India. You will hear Azan even in malls. Many malls have prayer rooms. 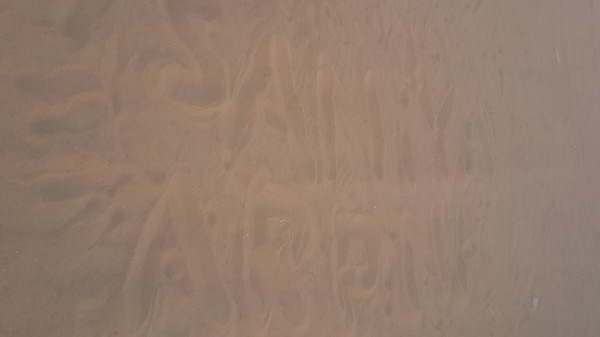 People are really friendly and they do understand Hindi. So be careful while you talk. The Samosas were nice there, do try if you find some. Most people understand what you mean by vegetarian food. Dubai is tax-free so you will see a lot of Landrovers here and other luxury cars. The Muslim population is less, so the government gives incentives to Islamic boys if they marry Islamic girls (only the 1st marriage). Prefer metro to taxi, not for Dubai mall. Dubai’s revenue is 70% based on tourism. Most of the buildings in Dubai are in brown tone because of the winds and dirt. This keeps buildings look clean. Thank you for sharing! They all seem amazing! Dubai looks like an amazing place to visit! Can’t wait to go there myself. Thanks for sharing your tips! Thank you for sharing!! Dubai seems like a very unique and fun place to visit! I know people have lived there and they enjoyed it. Wow this is a great article! Dubai has always been interesting to me but this really breaks it down! Wooooow!!! your article is amazing! 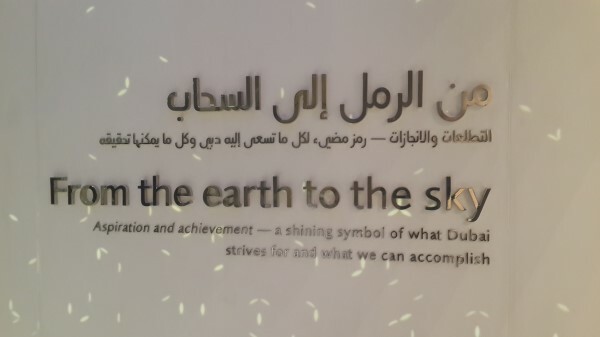 I’ve always wanted to go to Dubai but never knew where to start. Thanks for the itinerary. I’m going to check out some of these places. Thank you 🙂 I hope you plan a visit soon.